I Give Up! 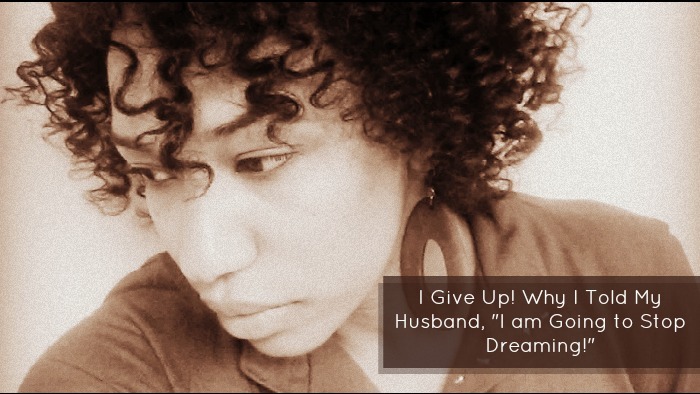 Why I Told My Husband, "I am Going to Stop Dreaming!" A little over a year ago, I was frustrated with certain things in my life and I just blurted out to my husband, “I am going to stop dreaming. I am just going to live this life, raise these kids and be your wife. That’s it!” I was so serious. I received that word and really sat with myself for a while. I thought, maybe I shouldn’t stop dreaming. It’s not like I really wanted to anyway. I believe I told my husband that because I was just mad that it seemed like life was going so slow. I was frustrated and in that small period of time, I was going to just give up! I am glad my husband told me not to stop dreaming, followed by a Word from my Bishop. Have you given up? Have you stopped, staled, or quit dreaming? Do you still think your dream is possible? Guess what? It is. Do you think you are too old? Guess what? You’re not! Do you think you can’t make it happen because you don’t have the education, money, or network? Guess what? Believe in yourself and let God lead you! Ask God to order your steps. Activate your faith and most importantly GO FOR IT! Let me tell you… I’m the oldest I’ve ever been, but I’m still YOUNG and I still don’t want to live my life with too many regrets going forward. I say too many, because I already have some and feel horrible about some choices I’ve made. But knowing what I know now, I want my days filled with happiness because I am going for what I desire. FYI… Dreams are not always attached to profit! Just because people tell you to follow your dream, doesn’t mean your dream will make you rich. So if you are going after your dream for that reason, you might want to re-evaluate it. I think we all want to be rich! Would be something you would do “for free”. Most of the time, people’s dream, changes other peoples lives in some form or fashion. Most people’s dreams really seem to serve others. It’s just what I’ve seen. My dream is no different. I can’t say you don’t have anything to lose going after your dream. Honestly, you could lose it all, but what happens if you don’t!? What happens if your dream comes true. Life Changes! That’s what happens. And even if it doesn’t, you tried. You went for it. Basically ladies and gents, don’t stop dreaming! 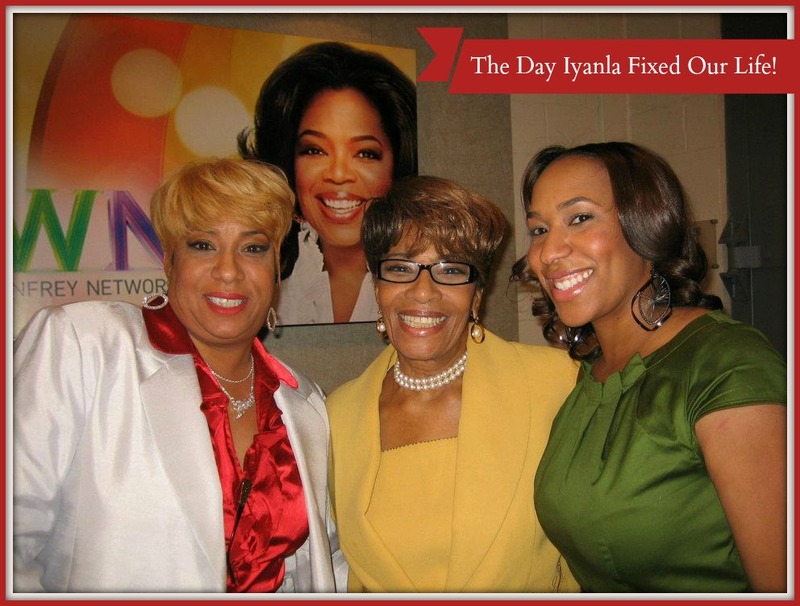 My appearance on Iyanla Vanzants "Fix My Life!" Really! Wow! Thanks Chrissy! What’s your dream? I would like to pursue a degree in Health science / Nutrition along with a fitness certification. Still haven’t figured out how to make it happen but I’m working on it. Thank you so much for your transparency and being real. This one really touch me right where I am today. You allowed the Spirit to use you to help me. Be blessed. You are so welcome! I was just driving and when I got to a stopping point, I just wrote it all out. I am glad it helped someone today. What’s your dream? I said almost the same exact thing to my husband recently! I was also dead serious. I may need to bookmark this post and read it again when my mind is more quiet. Thanks for this! Really!! I understand where you are coming from! Yes, don’t give up – and keep pressing! You will get there! NO ma’am…. WE can’t give up or give in!!!!! If we think about throwing in the towel we just have to use the towel to wipe our sweat and keep it moving! I’m making slow strives towards my dreams but I’m striving… slow don’t mean STOP! I have to remind myself – Do not despise these small beginnings, for the LORD rejoices to see the work. SMALL beginnings becomes GREAT endings especially when GOD is in it!!!! Thanks B. I really needed this today. Sometimes just because you know what you need to do to get to your dream does not make the process any easier..especially when life has a way of hitting you with the reality of where you are right now! I had to reaffirm myself today with the notion that I’ve come to far to give up now…this blessed me!!! This is an excellent article and very timely. I thank you for being obedient and writing this post because I needed to hear your message. God bless you Bernetta! xo! I needed this tonight! I honestly believe that by following your God-given dream you will find a beautiful life blessed by Him. More beautiful than we could plan ourselves! You filled my heart tonight. Much love to you! Bernetta! This post couldn’t be more “on time.” I praise God for helping me understand that as long as my dreams are tied to bringing glory to His kingdom, I’m on the right path. Sometimes, I feel like giving up, but then I think, “Who do you serve?” And I pick myself right up. Great post – straight from your heart! One of the most wonderful things about the God that we serve is that even when we stop or forget about our dreams He never forgets about them. Joel Osteen has a chapter about this in his book and I listen to it over and over again. Keep dreaming, girl! Love this Bernetta. I’m glad you didn’t stop dreaming. I am working on my dreams too and fighting all my doubts. EXCELLENT post!! I refuse to live a life of what if’s. I am chasing my dreams no matter what. Is it easy? Heck no! But as you mentioned your dreams should make you happy, give you peace and something you would do for free. I can honestly say that after losing my job in 2013 and then pursuing my purpose full time I am so happy and I have such a peace when I get to wake up everyday and do what I love which is helping and inspiring others through my coaching. I’ve coached for years for free without a title and now that I know that my gifts and purpose is to help others I am now able to do it for a living. I love how you mentioned to your husband that you were going to stop dreaming and God intervened through the minister to tell you “don’t stop dreaming.” Pursuing our dreams will not be easy, but it will definitely be worth it. Peace and Blessings! Amen! I am so with you. I know the feeling. You have so much inside of you and it seems like it’s taking forever to things to connect. Keep pushing, B! In due time, I know it! I love this post! I’ve had many of those moments whew I wanted to give up because it’s so much easier but something inside lets me know that I can’t. I love this so much! I agree, you can’t give up when times are tough. I’m dreaming about growing I Luv 2 Globe Trot to a big, commanding travel brand in the field. Stay tuned…Ask, Believe and Receive it!